Aquatic insects play important ecological roles in lakes and streams, but some scientists say the bugs’ susceptibility to contaminants like heavy metals rarely figures into the research the U.S. uses to establish water quality standards. The U.S. Environmental Protection Agency determines acceptable levels of contaminants in water based on a library of lab research on how aquatic organisms react to controlled exposures to pollutants. Yet that library is thin on the impacts to insects, even though they’re often among the dominant groups in aquatic systems. “The vast majority of the information that we have about what’s a safe contaminant and what concentrations might be safe of that particular contaminant are based on these laboratory toxicity tests, which routinely don’t include aquatic insects,” said Will Clements, a professor in the Department of Fish, Wildlife and Conservation Biology at Colorado State University. And the laboratory tests on insects that are included have problems of their own. The tests often say that some species are resistant to toxic effects, despite field surveys of contaminated streams that suggest otherwise. Clement’s lab has developed a toxicity testing method that better accounts for the ways that insects are exposed to stream contaminants in nature. A new study of this approach shows that at least some EPA standards for heavy metal concentrations may not be strict enough to protect sensitive species. One reason that insect toxicology plays a smaller role in water quality standards is that the bugs are difficult to raise for research purposes. Other animals like fish are easier to culture, so they tend to take up more pages of the research literature. Since researchers generally can’t grow insects in the lab, they have to pull test specimens from natural habitats. That practice might contribute to the discrepancy between lab tests and field observations, Clements said. Standard lab tests are also limited to measuring the effects of contaminants mixed into the water column. That neglects the additional exposure to contaminants that wild insects receive through eating tainted algae or detritus. Traditional tests are also relatively brief, generally lasting for just 96 hours, Clements said. The method that Clements has developed attempts to account for these shortcomings. First, test insects are collected in baskets filled with natural streambed gravel and cobble. The baskets are left in streams for 30 or 40 days while mayflies, stoneflies, caddisflies, midges and other insects of all ages and sizes colonize the gravel. When the researchers pull the baskets from the stream, they have a collection of species that looks reasonably like a natural community. 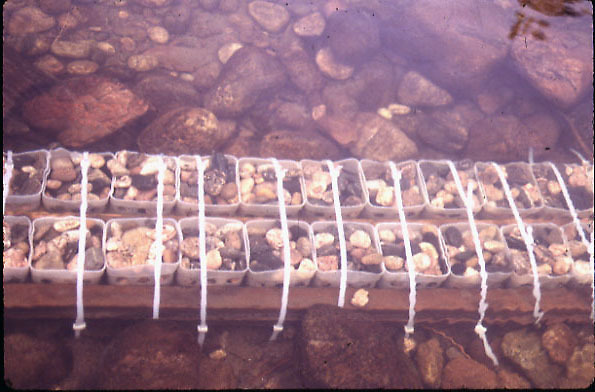 Back at Colorado State’s Stream Research Laboratory, the bug-laden gravel baskets are placed in microcosms that recreate flow conditions of a natural stream. These are oval, race-track shaped tanks with continuous flows regulated by paddle wheels. 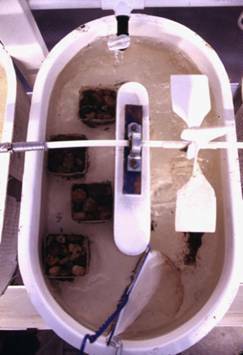 Clements used this setup to assess the effects of copper and zinc on aquatic insect communities, the results of which were recently published in Environmental Science and Technology. Insects across several microcosms were exposed to controlled concentrations of copper, zinc or a combination of the two. Though the insects persisted through ten days of exposure to what the EPA has determined to be safe concentrations of zinc, that wasn’t the case for those exposed to the federal standard for copper. Despite the apparent shortcomings of water quality standards when it comes to aquatic insects, there are signs that the EPA is coming around on the issue, Clements said. For example, the agency has recently developed water quality criteria for streams affected mountaintop removal mining that is based entirely on field data on aquatic insects.